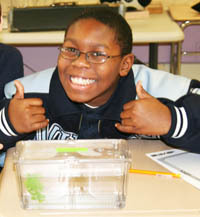 Project BioEYES, offered in Philadelphia, PA; Baltimore, MD; Salt Lake City, UT; and Melbourne, Australia, is a hands-on biology unit using live zebrafish and spanning five class periods over the course of a week. 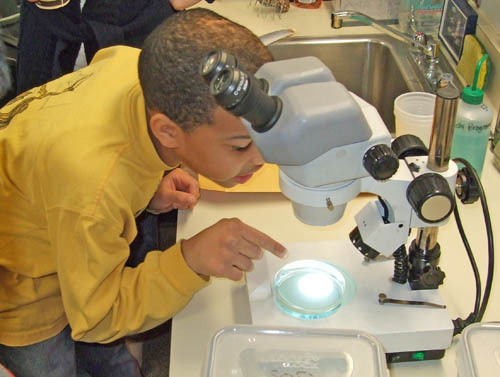 A 5th grade student prepares to use the microscope. Zebrafish, a model organism used in science, are inexpensive to raise and maintain and are easily transported to a classroom environment. Zebrafish are vertebrates that have many body parts in common with humans as well as sharing 70% of their genes with us. 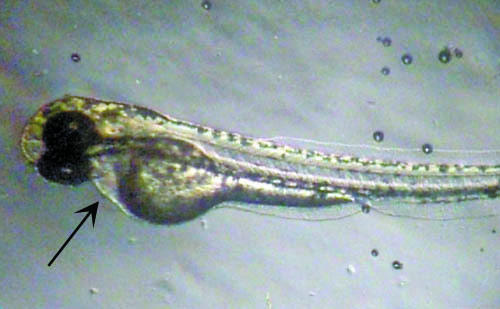 Zebrafish embryos and larvae are optically clear, which enables students to observe them without harming them. They develop from a single cell to a free-swimming larva in a few days, making it possible for students to witness the animal’s development within the span of the weeklong BioEYES unit. Students become very invested in the tiny fish they raise during the BioEYES week, and learning by working with these live animals captures the children’s imagination and is a key element to the success we experience in getting kids excited about science. On the first day of Project BioEYES, the BioEYES Outreach Educator brings all of the necessary equipment to the classroom, including the sophisticated microscopes students use to observe and study live zebrafish adults and their offspring. Each student is invited to assume the role of “junior scientist” in an important experiment. When given this role, students become energized with curiosity and excited about the activity. Students split into small groups, set up fish tanks, and choose mating pairs of zebrafish. Over the course of the week, students observe zebrafish behavior and follow the development of resulting embryos. Each day, just like research scientists in the laboratory, students hypothesize and test ideas, ask questions, record findings, and think critically about the impact scientific research has on our community. During the 2nd and 4th/5th grade experiments, students learn about the importance of habitat, the organ functions common to both humans and fish, the role of DNA, and different science careers. Students cross (mate) zebrafish to obtain embryos, whose development they will observe throughout the week. Students participating in the 7th/8th grade experiment cross albino and wildtype zebrafish on day one and subsequently observe embryo development, looking for answers to research questions about genetic inheritance. By the last day students observe the results, determine whether their hypotheses are correct, and discuss their understanding of dominant and recessive genes. 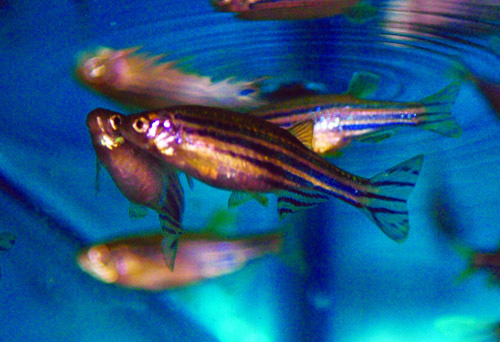 The 7th/8th grade curriculum also educates students about the use of zebrafish in scientific research and introduces them to related career possibilities. In the high school experiment, students also cross albino and wildtype zebrafish, raise offspring, and observe development and skin pigmentation. However, sophisticated aspects of genetics are covered, including the use of the Punnett square and more complicated genetic crosses. The discussion of science and allied careers is more in-depth with this age group as well. In all grades, the idea of the stereotypical scientist is broken down and students are encouraged to see that science is open to each of them as a career path. The beating heart of this larva is clearly visible under the microscope. On the last day, students in all grade levels observe the beating heart of a zebrafish larva. For most, this is their first glimpse of an actual heart pumping in real time. The experience often inspires a visceral reaction unlikely to be duplicated by a video or picture. Many students express delight and amazement and truly see the fish as like themselves.